These marinated and grilled tuna steaks cook up quickly on an indoor grill; either an electric model or a grill pan will work well. They're easy enough for a weeknight, but special enough for company, especially since they are fast and easy to make. If you're new to indoor grilling, follow these indoor grill cooking tips for success every time. Besides the ingredients, you'll need a liquid measuring cup, chef's knife, cutting board, measuring spoons, citrus juicer, countertop grill or grill pan, tongs, small saucepan, and a whisk. In a large zip-top bag, combine the soy sauce, chopped scallions, lemon juice, sesame oil, and fresh ginger. Swish everything around in the bag until it's well combined. Add the tuna steaks, turning within the bag to coat them completely with the marinade. Press the excess air out of the bag, seal, and marinate in the refrigerator for about 20 minutes. Preheat a countertop contact grill to "Sear" or the highest temperature setting. Place the sesame seeds on a plate or a shallow dish. 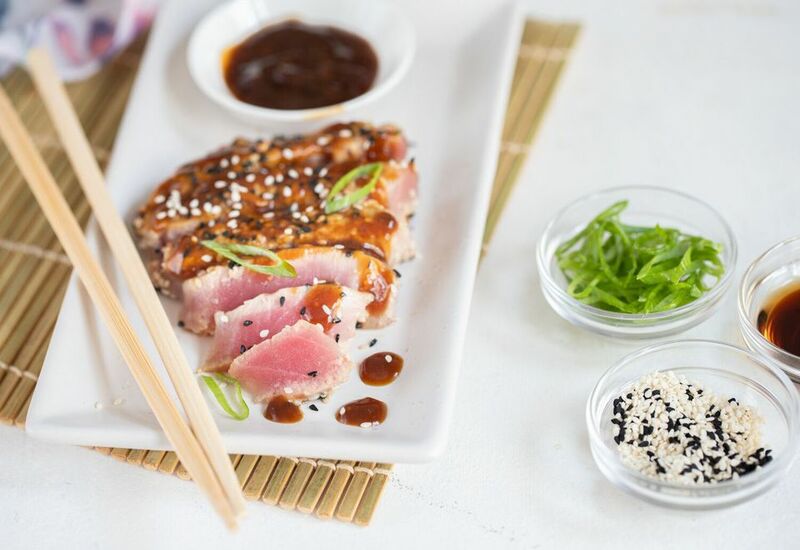 Remove the tuna steaks from marinade bag, brushing the scallions off the steaks and reserving the marinade. One at a time, coat the steaks in sesame seeds on all sides, pressing the seeds into the steak so they'll stick. Spray the grill plates lightly with nonstick spray and place the steaks on the grill, closing the cover so the top grill rests evenly on the steaks. Do not press down. Grill for about 3 minutes (longer if you prefer your tuna cooked through). Remove from grill and keep warm. If you are using an open grilling surface, carefully flip the tuna steaks with a pair of tongs after 3 minutes and cook for 3 minutes on the other side. While the tuna cooks, pour the marinade into a small saucepan and bring to a boil. Add the cornstarch, stirring with a whisk. Cook for about 3 to 4 minutes, until the sauce thickens. To serve, slice the tuna steaks on the diagonal into thin slices. Fan the slices on a plate and drizzle with the sauce. If you like your grilled tuna very rare, be sure to buy it from a reputable fishmonger. You want your tuna as fresh and high quality as possible. To easily prepare the fresh ginger, use the edge of a spoon to scrape the peel off a knob of ginger and grate it with a microplane grater or the fine grating blades of a box grater. Another option is to buy jarred grated ginger. It's often sold in the Asian section of supermarkets.